Just a bit more than one week after launching in the U.S., the Sony Xperia Z5 and Sony Xperia Z5 Compact have been reduced in price by $60 each at Amazon. The Xperia Z5 is now $539.99 after the price cut, while the Xperia Z5 Compact is $449.99. The price cut seems to have come rather quickly following the stateside release of the pair, but the U.S. smartphone market is extremely competitive. The U.S. versions of the handsets do not come with the fingerprint scanner found on both models in other markets. In addition, Samsung and LG are less than a week away from introducing their new 2016 flagship handsets, both of which feature the latest high-powered chipsets. The Sony Xperia Z5 features a 5.2-inch display with a 1080 x 1920 resolution screen. The Snapdragon 810 SoC is under the hood carrying an octa-core 2.0GHz CPU and the Adreno 430 GPU. 3GB of RAM is inside with 23GB of usable internal storage. A 200GB capacity microSD slot is available to those seeking additional memory. A 23MP camera adorns the back, while the front-facing 5MP snapper handles selfies and video chats. The 2900mAh battery provides up to two-days of power, and the phone is IP 65/68 rated for dust and waterproofing. Android 5.1 is pre-installed. 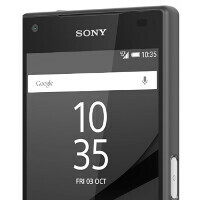 The Sony Xperia Z5 Compact shares some of the specs belonging to the Xperia Z5. The only differences are the Compact's smaller 4.6-inch screen (with a lower 720 x 1280 resolution), the inclusion of 2GB of RAM, and the smaller 2700mAh battery. If you're interested in taking advantage of the price cut, click on the sourcelink. Keep in mind that these models work with the AT&T and T-Mobile networks. Still a bit much, I think the Z5 should be $449 and Z5 Compact $399. It's a Sony, not an iPhone. With highend specs and Dragontrail glass, why so less. Sony is well known quality manufacturers. Because they are devices being released without a key feature, at the utter tail end of a product life cycle. well if it doesn't have a fingerprint scanner it's a legit reason to lower the price. Honestly feel sorry for the americans to loose awesome function. Hi Xperia Z is a great phone and i have one. Now i want to get other Xperia z5 for my brother. Great phone.